Retail Management Solutions has become the industry leader in pharmacy point-of-sale innovation. Our centralized focus on pharmacies allows us to continually respond to the needs of our ever-changing marketplace. We are committed to offering products and services on the cutting edge of technology, like our latest mobile technology, EvolutionPOS. Our trainers and support staff understand the pharmacy environment, because that’s all we deal with. When you call our 24/7 toll-free support line, your support representative knows about the pharmacy industry and understands the environment in which you are working. RMS has scalable solutions that meet your needs, whether you own a single-register apothecary, a 15-register superstore, or multiple locations. Successful pharmacies rely on RMS systems. 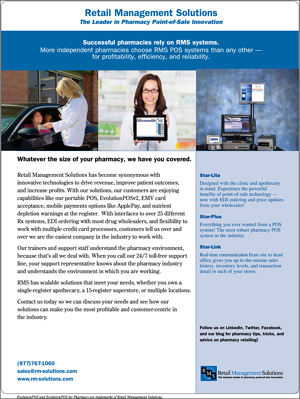 More independent pharmacies choose RMS POS systems than any other – for profitability, efficiency and reliability. Everything you ever wanted from a POS system! The most robust pharmacy POS system in the industry.